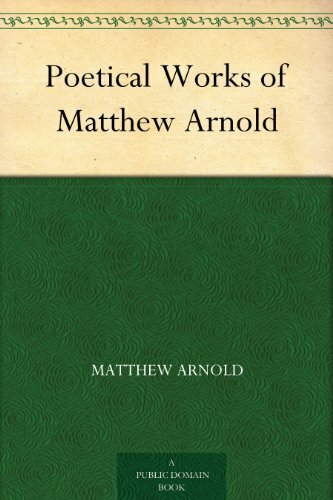 Matthew Arnold was born in 1822, the son of the celebrated headmaster of Rugby, Thomas Arnold. Matthew attended Balliol College, Oxford and was a close friend of an older fellow Rugbeian, the poet Arthur Hugh Clough. In 1847 Arnold met and fell in love with Mary Claude (in his poems he gives her the name Marguerite), who was holidaying near Arnold’s parents’ house, Fox How, in the Lake District. She was a writer herself and a lively and enterprising member of a family of girls brought up in a French community in Germany. Mary walked with Arnold in the moonlight, but their love did not prosper, as the Marguerite poems show. Isolation expresses his personal failure in love, while the poem beginning ‘Yes! In the sea of life enisled’ explores a more general sense that we are all ultimately condemned to live and die alone. Mary never married, but, after Arnold’s own marriage to Fanny Wightman in 1851, she lived permanently in the Lake District, close to Fox How, until her death in 1912. The poem 'Lines in Kensington Gardens' was sent to Arnold’s sister Jane in 1849. It is an early taste of his later controversial prose criticism of the society and culture of nineteenth-century England. Wordsworth was a friend of the family; there are Wordsworthian echoes in Arnold’s account of ‘the city’s jar’. This sombre note is sounded with greater complexity in Arnold’s most well known poem, partly written on his honeymoon. Dover Beach opens with images of beauty and profound security, but then the sound of the water on the shore expresses his sense of the loss of faith and his longing for old certainties. Dark terror lies beneath the fragile happiness of human love. Arnold complained to his brother of ‘the disadvantage and absurdity of our hereditary connection in the minds of all people with education’. He was a son of a famous father, and sometimes he chafed. Yet he became a school inspector and a great educationist. This ambivalence perhaps underpins the epic Persian story of Sohrab and Rustum, where a father and son meet in single combat without knowing they are related, and the father kills the son. It is a marvellous, atmospheric narrative, gravely melancholy, and perfect for reading aloud. 'The Scholar-Gipsy' is based on an old legend of a wandering scholar; Arnold uses it to evoke the places he visited with his Oxford friends, and to contrast the single-minded simplicity of the scholar-gipsy with the ‘strange disease of modern life’. In later years, Arnold turned increasingly to writing prose, and was established as the leading critic of his day. He attacked the materialism and provincialism of English life and culture, arguing that England needed more intellectual curiosity and a more European outlook. He died in Liverpool in 1888 while waiting for his daughter Lucy to return from New York.